Now there is a new way to straighten teeth without braces. So invisible … no one will notice. Invisalign ® uses a series of nearly undetectable aligners instead of brackets and wires. So even up close it's really hard for people to tell you're wearing Invisalign ®. This new treatment can give you the smile you've always wanted without the braces you've always avoided. Our office will give you an initial examination to determine if Invisalign ® treatment is right for you. If it appears that Invisalign ® is an option, we will take photographs, x-rays, and an impression of your teeth. We will then complete further diagnostic analysis to verify that Invisalign ® will work for you and create a treatment plan that will determine exactly how the teeth are straightened. At that time, we will be able to let you know if you qualify for orthodontic insurance benefits and the estimated cost and length of treatment. When the treatment plan is complete, your records will be sent to Invisalign ® along with the dentist's instructions. Using the latest advances in 3-D computer technology, Invisalign ® will translate the our instructions into a series of precisely customized aligners. You will wear each set of aligners for about two weeks. 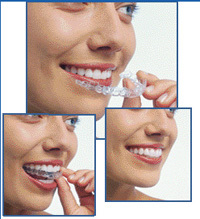 Each set of aligners will gradually move your teeth closer and closer to the desired result. You will need to wear these aligners all the time except when you are eating, drinking, or cleaning your teeth. Both of these people are having their teeth straightened. Because there are no metal wires and brackets, Invisalign ® is more comfortable than traditional braces. And because they are removable, eating, brushing and flossing are no problem. You can still enjoy your favorite foods and smile without holding back. With Invisalign ®, there's nothing to hide. In both clinical research and in orthodontic practices nationwide, Invisalign ® has been proven effective at straightening teeth. Treatment takes about the length of time as traditional braces and is far more comfortable. Thousands of patients are taking advantage of this revolutionary treatment. Throughout treatment, we will arrange for check-up appointments about every six weeks to make sure that treatment is progressing as predicted. As treatment nears completion, the dentist will design a retention plan to help you keep your smile for life. You can relax knowing that your treatment is being diagnosed and monitored by an Invisalign ®-trained orthodontic doctor, and enjoy the convenience of treatment at our office. We will even be able to finish your case with tooth whitening dentistry if you desire, to give you a gleaming, bright smile. Find out if Invisalign ® treatment is an option for you to get the beautiful smile you've always wanted. Call today at (757) 547-7070 for a consultation.